In analysing infrastructure election commitments to the Sunshine State the Chamber of Commerce and Industry Queensland (CCIQ) believes the Coalition needs to strengthen its financial pledge to the State. CCIQ likes elections as it is always a great opportunity to secure a commitment from a politician to do something meaningful to help small business or to invest in key infrastructure projects. Queensland secured $8.4 billion dollars from the Coalition in 2013 in the area of road funding alone. Key projects that were committed to were the Toowoomba Second Range Crossing ($700 million), Bruce Highway Upgrade ($6.7 billion) and the Gateway Motorway North (($1 billion). We only have to look to these projects to see that essential major infrastructure projects can reach building stage as a result of a Federal Election. There is no question that Queensland has proven itself to be a key battle ground for the Federal Election. However, this time round the financial commitments have thus far fallen short in our view. 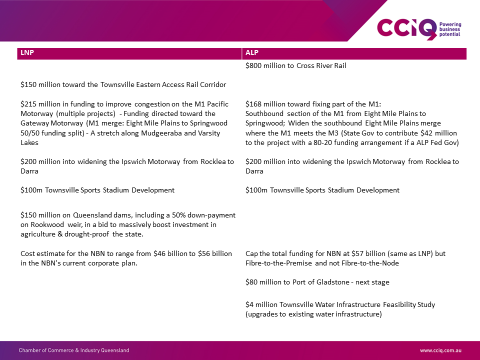 We have seen commitments from the Coalition for projects such as Townsville’s Eastern Access, Sports Stadium Development and Water Infrastructure. Dams and the NBN has also been placed on the table by the Coalition. The noticeable exceptions are Brisbane’s Cross River Rail and more funding for the M1 motorway through equitable funding arrangements as would occur in NSW. Infrastructure Australia has identified a macroeconomic cost of $9 billion by 2031 if delays to inadequate transport networks in Queensland are not addressed. For business what the practical impact of this $9 billion dollars looks like is increased cost of doing business; decreased efficiency and productivity; and reduced access to existing markets and expansion into new and emerging markets. Quite simply this Federal Election will be one of only a few very limited opportunities for Queensland to secure the Commonwealth commitment required to fund our vitally needed projects. Queensland’s transport infrastructure in businesses’ view requires significant investment in order to achieve improved capacity, reliability, efficiency and safety. It is not too late for the Coalition to strengthen its infrastructure commitment to the Sunshine State.